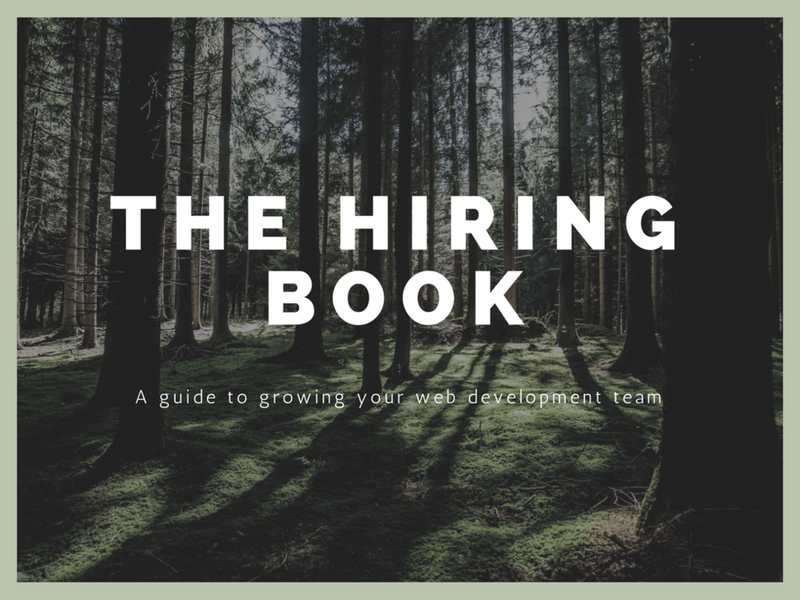 This is my review of The Hiring Book, a book on hiring web developers by Najaf Ali from Happy Bear Software. I pre-ordered this book the first chance I got because I have a lot of time for its author Najaf. I’ve interviewed him about freelancing and I appeared on an episode of his CTO show podcast. I enjoyed reading this book so much that I asked Najaf if I could become and affiliate and promote it. I wanted to mention these things as caveats. You could choose to treat the rest of this review like a sales pitch and ignore anything I have to say. I like Najaf because he spends more time thinking about things than most people I’ve met and I asked to be an affiliate because I love this book and I want to get paid for the shouting about it I was going to do anyway! Those of you reading this that have followed my career in any way will know that I have started my own company. You would think this would mean I wouldn’t need to worry about hiring developers that often. One of the services I offer is to act as an interim CTO to help companies overcome the hurdles they have when dipping their toes into all things tech. Hiring a development team is a recurring issue. I wanted to read this book to see if it could give me tips to help me help my clients better. I’m reviewing a digital copy of the book as a PDF file, as far as I’m aware this is the only way you can access this book. PDFs aren’t the most accessible things but I had no issue loading the book onto both my Kindle and the Kindle app on macOS. The presentation when on the Kindle was 100% and it was able to save my place for me, other PDF viewers may not be as good. It is a short book, coming in at 72 pages. When I first noticed this I was a bit worried that things wouldn’t get covered in adequate depth. What Najaf has done has limited the scope of the book to things he has tried and tested opinions on and described those things concisely. People in charge of building software will tell you that their biggest issue is hiring developers. From the developers point of view there is a shortage of decent companies to work for. There are things you can do that will give your company an unfair advantage over other companies trying to hire developers. I’ve been in charge of development teams and tasked with hiring in developers – it is a huge issue. As a developer I’ve been involved in some terrible interviews and have been in some ropey hiring pipelines. Once sold on the first two assumptions, I was more than excited to dig into the book to hear about these unfair advantages. As you can see from the chapters listed, the book covers the life-cycle of a developer in your team. You may think the ordering is wrong (“What to do when they leave” as chapter 3?!) but Najaf explains the order he has chosen for the chapters. Each chapter can be read on a short commute or break but has enough actionable takeaways that you will want to put the book down and start making changes. My personal favourite chapters were “What to do when they leave”, “You don’t need interviews”, and “Structure your hiring process”. These are all areas I’ve noticed to be particularly lacking in development teams. Something that I struggle with in books aimed at managers or leaders is sometimes the examples used just aren’t experiences I’ve had, so I can’t empathise or properly see the point of the change they are suggesting you make. Luckily for me this wasn’t an issue in this book. The only real constant across how companies in the technical industry hire is how badly organised their application process tend to be. Candidates apply and receive no response, are left hanging part way through the process, and generally aren’t treated with the significance that the new intake of your development team deserves. There isn’t a developer or manager of developers alive who wouldn’t agree with the above statement. It is from the start of the “Structure your hiring process” chapter and immediately helps to set the scene for the advice to come. Before reading this book my success criteria when hiring was an extra person on the development team. Suffice to say I have plenty of takeaways! I need to treat hiring developers like I would treat trying to get a new client with a high lifetime value. I need to plan my interactions more in advance and track everything so I can see what is working and what isn’t. The work of hiring someone isn’t confined to between realising your need to hire someone and the time you’ve hired them. It is a continual investment with a long term focus. How to set your team up for success including after they have left your company. Thinking about what to do after someone leaves is something I didn’t manage at all and there are things I can now think of I could have improved that would help. I need to apply systems thinking to the hiring process. If I can put systems in place I can help avoid biases and create a consistent experience for those coming through. This is better for candidates and better for me as I have consistent data to test against. If I had to sum up my takeaways in one sentence. Hiring developers is a serious business that has long term, far reaching effects on your company and your profit – treat it with the gravitas it deserves. I’d have loved to see more further reading that didn’t involve adding to my library. Some sort of middle ground between the description Najaf gives and a book. Whilst I’ve added plenty of the books mentioned to my wish list, a good article explaining the concept in more detail would have been helpful. A book that does this well (see what I did there) is The Personal MBA. I’m a fan of anecdotes from other people in books. I’m aware they are at the service of the author’s point but the extra voice in a chapter can often make the advice or issue seem more real. This book has some personal anecdotes but it would have been interesting to read some from other people. I can’t recommend this book enough. If you’re ever in the position to be hiring developers, or ever think you want to be then this book is a must read. It is short enough to read in a couple of sittings, but you’ll want to take plenty of notes as you go through it. You can buy it from Gumroad.